An important issue for everyone using an Android phone is whether you’re about to burst through your monthly data quota. Mobile data surcharges can pinch the wallet, but your Android phone has a handy tool to help you avoid data overages. It’s the Data Usage screen. On some Samsung phones, you’ll find the Data Usage item by choosing the Connections tab at the top of the Settings app screen. The main screen is full of useful information and handy tools. The line chart (left) informs you of your data usage over a specific period of time. You can touch the Data Usage Cycle action bar to set that time span, for example, matching it up with your cellular provider’s monthly billing cycle. The orange and red lines are used to remind you of how quickly you’re filling your plan’s data quota. Warning messages appear when total data usage passes each line, first the orange and then the red. To set the limits, touch the graph on the screen. Use the tabs that appear to drag the limit lines (orange and red) up or down, and the data usage cycle lines left or right. 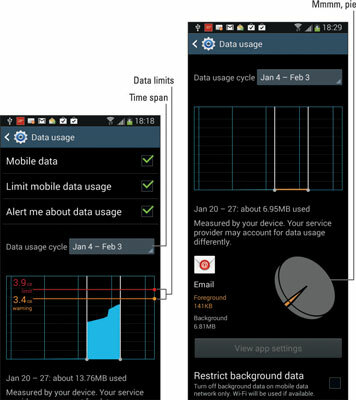 You do need to activate the Limit Mobile Data Usage item, shown on left of the figure. This item might also be named Set Mobile Data Limit. To review access for a specific app, scroll down the Data Usage screen and choose the app from those shown. Only apps that access the network appear. After choosing the app, detailed information shows up, similar to what’s shown, right. If you notice that the app is using more data than it should, touch the View App Settings button. You may be able to adjust some of the settings to curtail unintended Internet access.